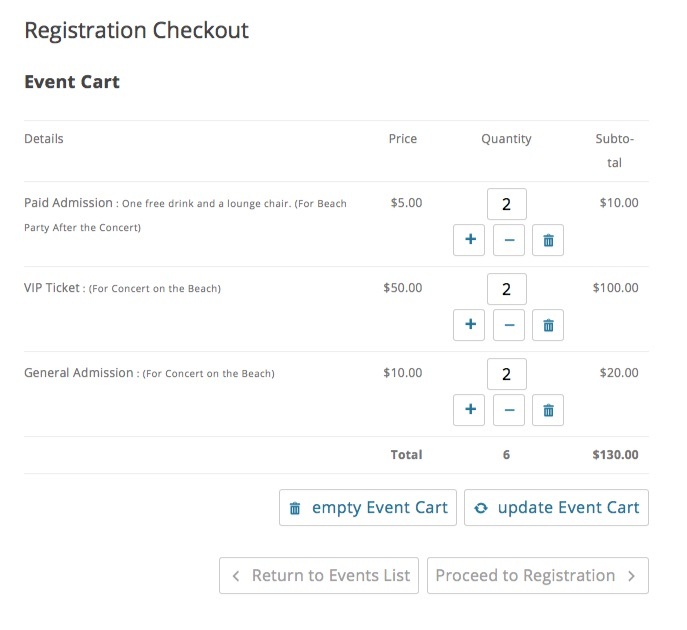 The Multiple Event Registration add-on for Event Espresso 4 adds an event shopping cart feature on your website. It will allow your attendees/registrants to register for multiple events with only one checkout process needed! Need to Buy a Support License for the Multiple Event Registration Add-on for Event Espresso 4? The Multiple Event Registration add-on is included in the EE4 Everything Support License. That way your audience can add more tickets to their cart from one page. 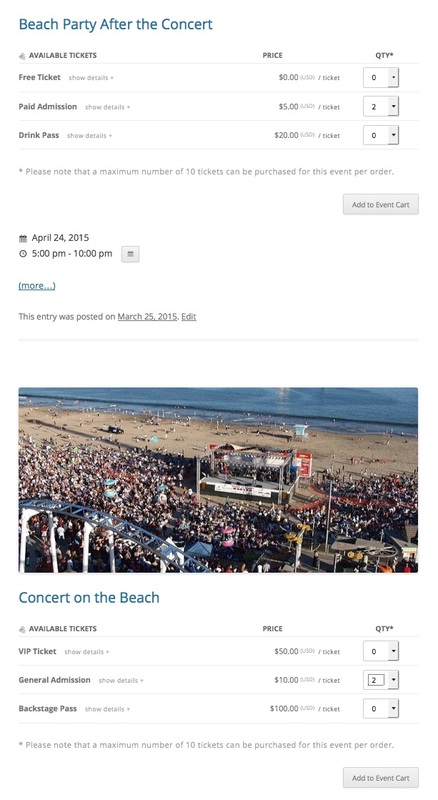 The events on the event listing page will receive an “Add to Event Cart” button as shown in the image above. Please note, users can only add tickets from each event individually. Selecting tickets from other events, on the same screen, does not automatically add all selected tickets to the cart. Clicking the Add to Cart button will only add the tickets for that event. The EE4 version of the Multiple Event Registration add-on comes with its own Event Mini Cart Widget. You can activate and configure the widget from within WordPress → Appearance → Widgets admin page the same as any other WordPress widget. Once the Event Espresso Mini Cart Widget is activated, visitors will see it in the chosen location. After adding an item to the cart, your attendees/registrants will be shown a “View Event Cart” button on any event, in the list, that they have added. Clicking the “View Event Cart” link link will then take the registrant to the cart confirmation page, where they can then select the number of tickets / pricing options they want, remove events they no longer want, and proceed to registration checkout. You may notice here that the customer can select multiple amounts of the same type of ticket! The available number of tickets a customer can register for at one time, is determined by the “Maximum number of tickets allowed per order for this event” setting in the individual events. Messages are generated for each unique registration status in a transaction matching the message type corresponding to that message type. This means if a transaction has two registrations in it with not approved status (because the Events in the cart for those registration has a default registration status of not approved), and three registrations in it with approved status, then there will be messages generated only for the not approved registrations using the registration not approved message templates, and another set of messages generated for the approved registrations using the registration approved message type. Event Authors will always receive messages that contain only information related to the registrations on their event(s) for a transaction. So if there is a transaction where all the registrations are approved and its for tickets across three different events, and Event A and Event B is authored by User A and Event C is authored by User B: then User A will receive one message containing only information based on registrations for Event A and Event B, and User B will receive one message containing only information based on registrations for Event C.
Custom Templates are only used when a message is generated that contains only information pertaining to a single event and that event has a custom message for that message type. So if a registration approved message is generated for the registrant recipient context and it contains information on three registrations across three events, then the global template for registration approved messages is used. However if that was only for one event (Event A) and that event had a custom message template for Event A, then the custom template for registration approved messages will be used. When resending messages from the registration list table using the bulk action. The system will automatically group messages into as few as possible for each context and registration represented in the bulk selection. Messages are first grouped by transaction, and then by registration status, and then the expectations listed in the previous points above apply. An important fix that occurred in Event Espresso 4 core as a result of the improvements made for MER, is that when resending messages in the admin, all active contexts have messages generated. Prior to this fix, only the registrant recipient received messages (or primary recipient if there is no registrant recipient). This message type provides a summary notification to Primary Registrants and Admin recipients when there are multiple registrations in a transaction with different statuses. If this setting is not on by default when activating the Multi Event Registration add-on, you can enable it in the Event Espresso > Messages > Settings page. If you plan on allowing registrants to make payments at a later date, instead of using one of our many payment gateways, then you may find it necessary to apply a payment to specific registrants as opposed to all of the registrants for a transaction. For example, if a customer sends a check to ONLY pay for their registration but not others, then you will need to manually apply that payment to the transaction by visiting the Registrations Admin List table (WP admin > Event Espresso > Registrations) and find the registration for that person, then click on the TXN Date link to bring up the transaction details for that registration. If you select the “Just the following Registrations” radio button, then you will be able to apply the payment to any of the available individual registrations in that list. Note #1: Payments are applied sequentially to registrants. So if you have two registrants that each owe $10, and apply a $15 payment with both registrants selected, one registrant will receive a $10 payment (the max they owe), and the other will receive the remaining $5 as payment. If the first registrant had already paid $5 at some point, then they would only receive a $5 payment this time, and the remaining $10 would then be attributed to the second registrant. Note #2: Registration status is controlled manually via the admin. Applying a payment to a registrant that fully pays off their amount owing will NOT result in their registration status being toggled to “Approved”. Registration status for any registrant will ONLY be changed if the setting in “Change Registration Status” is different than their current status. Obviously, clicking “Leave the Same” will have no effect, regardless of any payment amount attributed to an individual registrant. Note #3: Notifications are sent to ALL applicable registrants regardless of registrant selected in the “Registrations to Apply Payment to:” table. So Registration Approved notifications will be sent to ALL Approved registrants regardless of whether their status changed as a result of any payments applied here. Just like applying payments to registrations, if you select the “Just the following Registrations” radio button, then you will be able to apply the refund to any of the available individual registrations in that list. NOTE #1: refunds are applied sequentially to registrants. So if you have two registrants that each paid $10, and apply a $15 refund with both registrants selected, one registrant will receive a $10 refund (the max they paid), and the other will receive the remaining $5 as a refund. If the first registrant had only owed $5, then they would only receive a $5 refund this time, and the remaining $10 would then be attributed to the second registrant. NOTE #2: registration status is controlled manually via the admin. 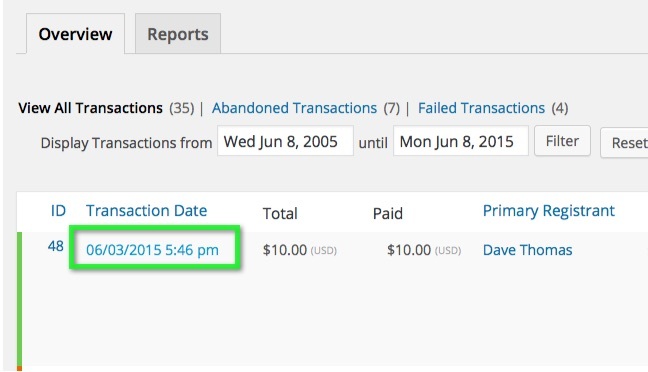 Applying a refund to a registrant does NOT result in their registration status being toggled. Registration status for any registrant will ONLY be changed if the setting in “Change Registration Status” is different than their current status. Obviously, clicking “Leave the Same” will have no effect, regardless of any refund amount attributed to an individual registrant. This is no different than current behavior. NOTE #3 : notifications are sent to ALL applicable registrants regardless of registrant selected in the “Registrations to Apply Payment to:” table. So Registration notifications will be sent to ALL registrants matching the status in the “Change Registration Status” select dropdown, regardless of whether their status changed as a result of any refunds applied here. Are you running a current version of Event Espresso 4? This plugin does not create any new menus in the WordPress admin screen. It automatically changes the registration process to facilitate registering for multiple events at one time. How do I change the color of the _____ button? As with most style oriented customizations, button colors, fonts, and text styles are all controlled by your WordPress theme. Can there be more than one primary registrant per order? No, for the time being and the foreseeable future, attendee #1 is the ONLY primary registrant. There can only be one. Cart? Event Cart? Ticket Basket?